My first visit to the island was in the summer of 1984. A pal and I had borrowed a tent from a work colleague and camped at a pay-site near Brodick. 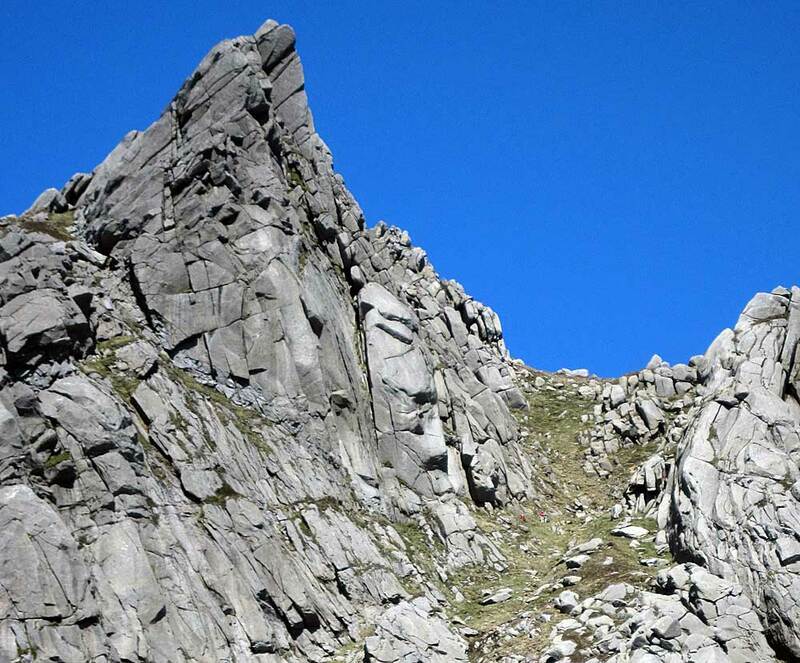 The following day we did Goatfell via the Tourist Path. It was sunny but breezy at the top. No sign of any Adders - the mountain`s supposed to be a favourite spot for them, but we were plagued by wasps at the trig point. There must have been a nest nearby. We continued along the ridge to North Goatfell, seeing several small herds of deer, then dropped down to pick up the path leading to Corrie village. 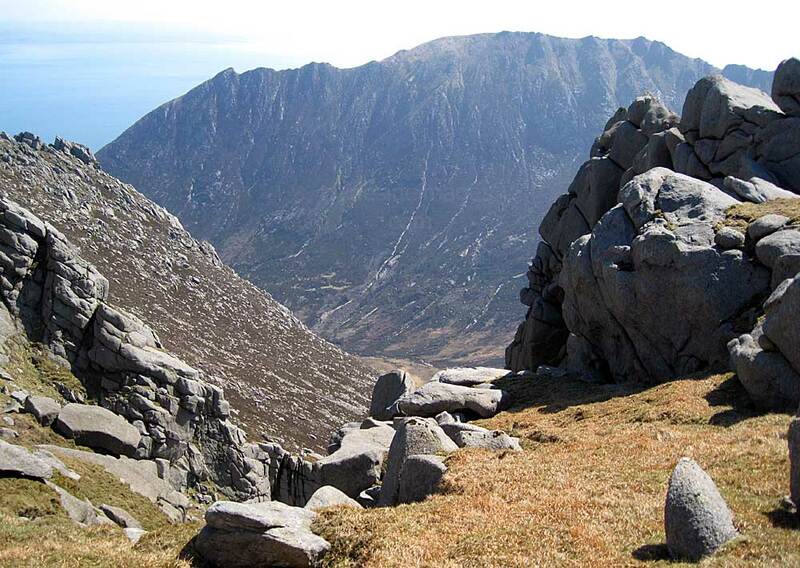 In August 2006, the press reported that a man in his forties from Saltcoats suffered a severe, potentially fatal, allergic reaction after he was bitten by two Adders in the Goatfell area. He had been looking for a picnic spot during a walk with his brother and their children when the kids saw a snake slithering through the grass. The man picked it up, then another much larger one appeared so he grabbed that with his other hand, holding the snakes up so his brother could take a photo on his mobile phone! Needless to say both angry reptiles were camera shy, sank their fangs in, then escaped in the ensuing panic! The man was fortunate to survive and was hospitalised for six days. His brother, according a daily newspaper, reckoned that the authorities should put up warning signs to stop tourists picking the Adders up! I don`t think we`ll see any of these people on University Challenge! An excellent day-trip with my nephew Steve, sailing out on the first ferry from Ardrossan. The sky was overcast during the walk-in from Brodick and clouds blew across the mountain, blocking out any view as we neared the top. We had the cairn to ourselves initially and fortunately, after about 15 minutes, conditions improved. A leisurely walk along the ridge as far as Mullach Buidhe followed before we called it a day, returning to Brodick via Corrie village. Timed it well and managed to walk straight on the ferry which left a few minutes after we boarded. With the prospect of a fine day ahead, I caught the first ferry over to Brodick for a day on the hills. The bus to Lochranza dropped me at the Distillery where the signposted trail that leads to Davie`s Loch begins. 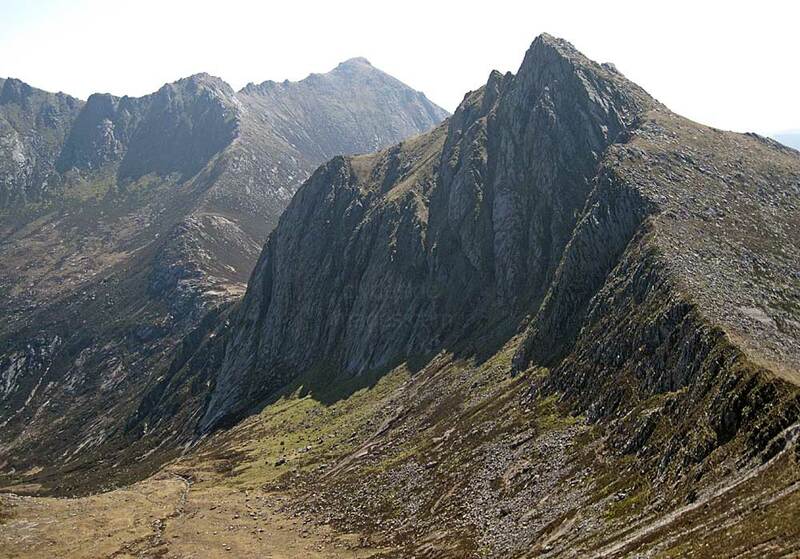 ​My target peak was Caisteal Abhail, a Corbett which I hadn`t yet climbed despite numerous visits to the island. 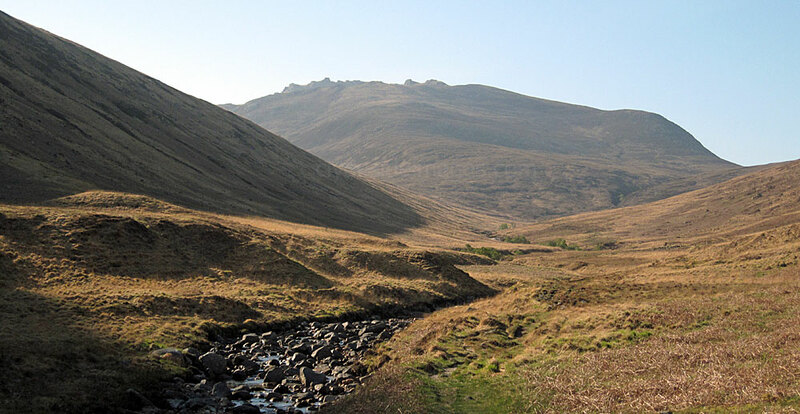 This mountain`s famous Witch`s Step appears to bar progress to non-climbers ascending from Glen Sannox but a path contours round the obstacle and avoids all difficulties. My chosen route up the easy northern slopes avoided the `step` altogether. Above: Looking back to the Distillery from the track just above the village. 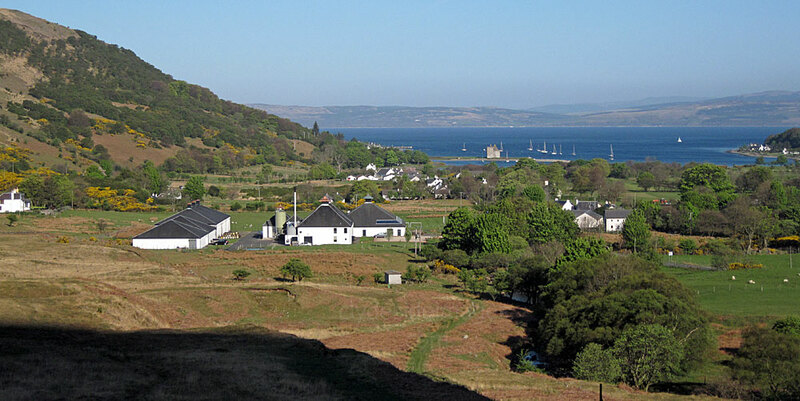 Lochranza Castle can be seen just right of centre. ​This unoccupied stronghold occupies a fine position on a spit of land on the south shore of Lochranza Bay. The original fortress dates from the 13th or 14th century but it was extensively remodelled in the 16th century. 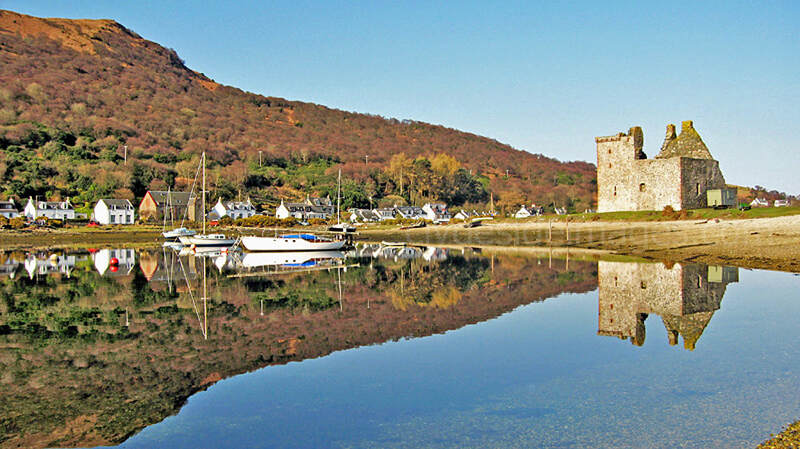 Reputedly Robert the Bruce used Lochranza Castle as a hunting lodge and forces loyal to Oliver Cromwell captured it in the 1650s. Deer often wandered down to the shore here to eat the seaweed which has a high mineral content. 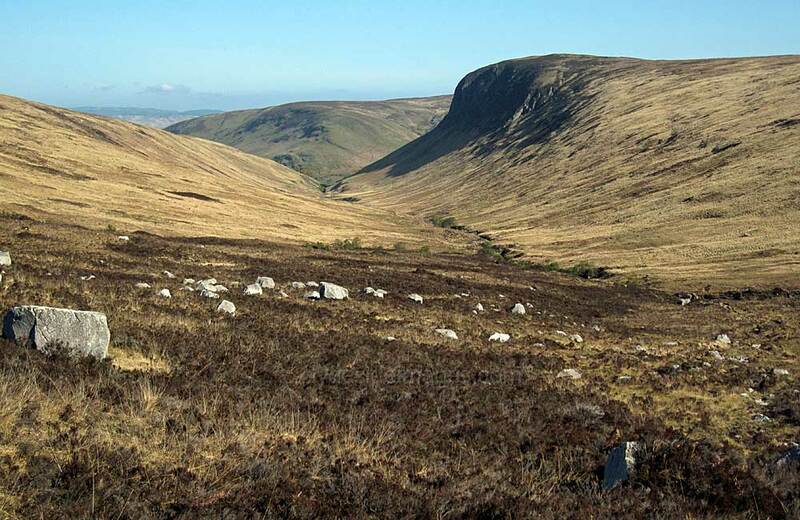 After an initial steep but short pull alongside the picturesque gorge in Gleann Easan Biorach the terrain widens with rounded grassy hills on each side for much of the way. 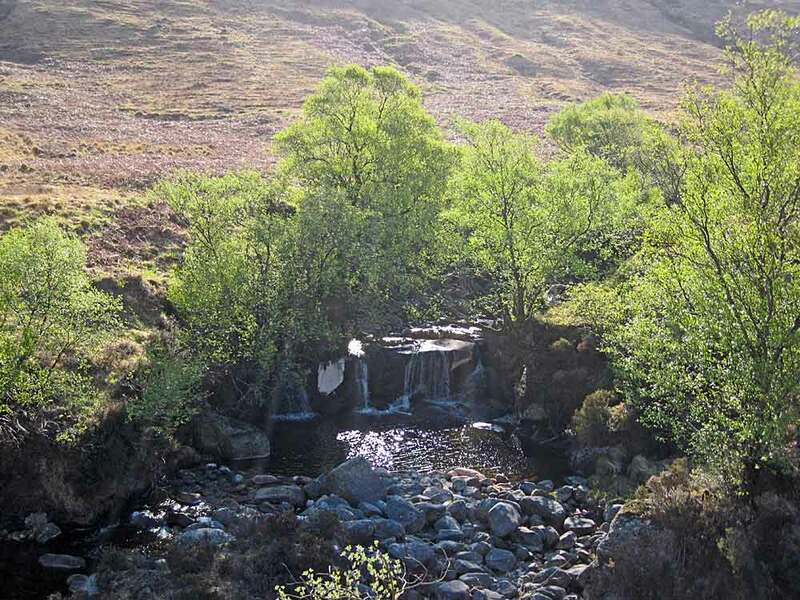 The burn has several small waterfalls forming pools which would be ideal for a dip on a hot summer afternoon. The track begins to rise gradually and, despite a recent prolonged dry spell, sections were still boggy underfoot. Looking back along the route. Lochranza lies hidden behind the hill sloping in from the left. ​Above: Heading for Caisteal Abhail. These easy-angled, northern slopes conceal the tremendous panorama that awaits when the summit is reached. Wildlife sightings were fewer than expected but I did spot a Dipper on the burn and a Green Hairstreak butterfly. On the higher slopes the only birds noted were Wheatears, Meadow Pipits and a pair of Red Grouse. 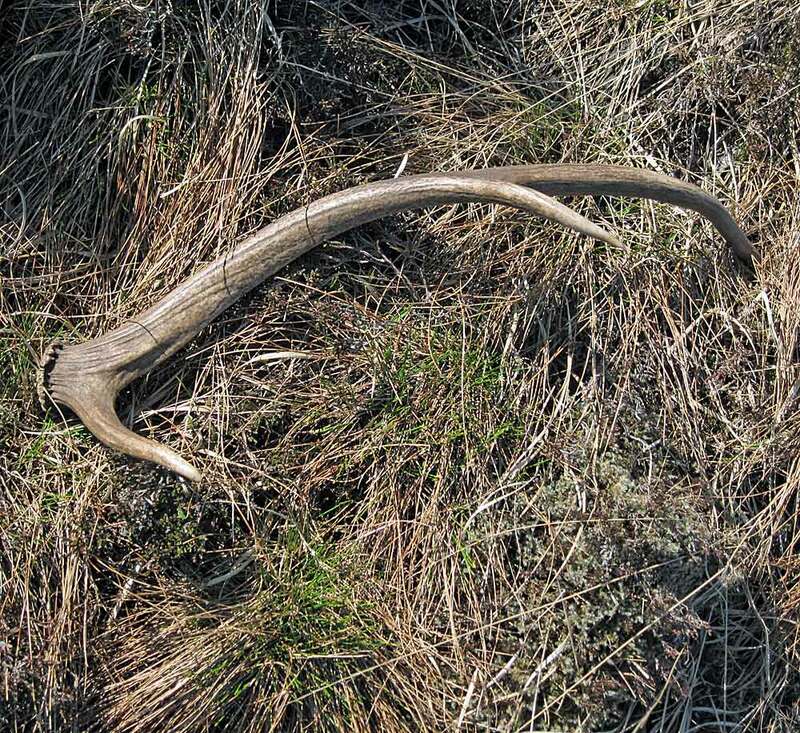 The closest I came to seeing an adult stag was this shed antler. ​The breeding season, or rut, occurs from the end of September to November and contrary to popular belief, fights to the death are rare. Nor is it always the stag with the most powerful set of antlers that wins the day. Stags with no antlers, known as `hummels`, regularly come out best as they are often heavier and in better physical condition as no vitamins have been diverted into growing antlers. Once the antlers are shed, stags tend to form bachelor groups. ​Above Left: The view northwest to Meall Mor. I hope to explore the Meall Mor group on my next visit to the island. Although the main top is only 496 metres, a high-level walk from Catacol to Lochranza looks interesting. The view on the right was taken from the open slopes of Caisteal Abhail, and looks back along my route. It`s not until you`re well on the way to the summit that the superb skyline of these Arran`s peaks gradually comes into view. Although anyone wishing a bit of a scramble can make a direct descent eastwards from the top of Cir Mhor it`s far less taxing to head for the bealach between Cir Mhor and Beinn Tarsuinn where a well-constructed path leads down into Glen Rosa. 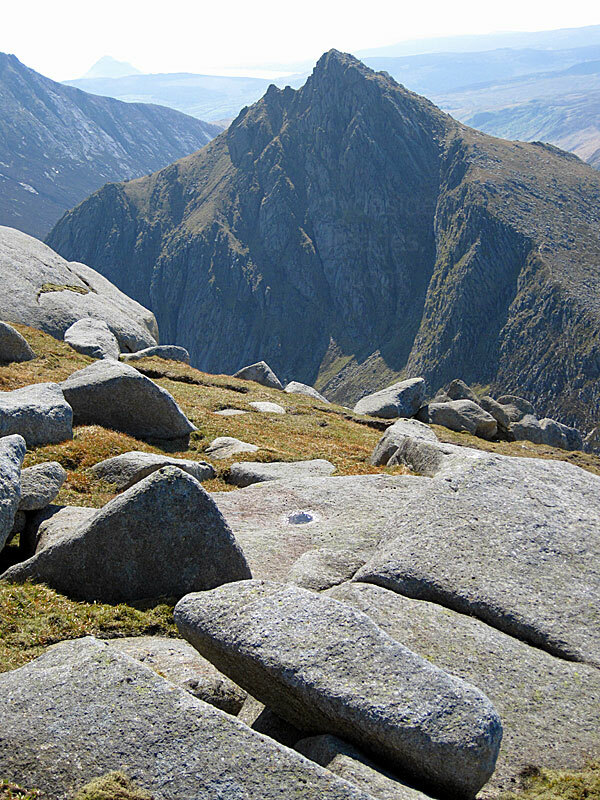 A party, two of whom are wearing red T-shirts, have chosen the adventurous route down from Cir Mhor and can be seen descending the grassy gully right of centre in the above shot.